Broads Electrical is a small Norfolk based company, offering an Electrical Contracting service to Commercial, Domestic and Agricultural clients. 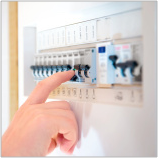 All our work is carried out by fully qualified electricians and is guaranteed. We are a local company with over 15 years experience, we are always available to help you make the right decision, whether it is in regards to a full electrical installation, a new lighting design or just an additional power point. Do you need qualified professionals doing quality work on time and budget every time?